Every fall my mother forced to feed us radishes. 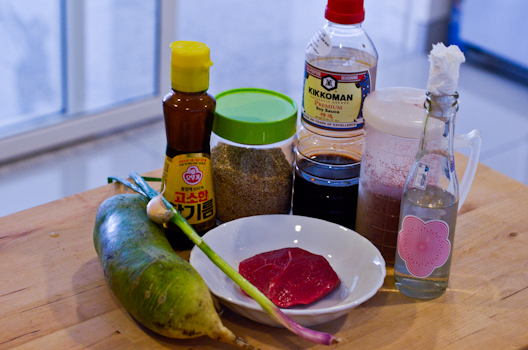 Radish soup, radish salad, radish kimchee, … and the radish rice – the worst one. I don’t think radish is kids friendly vegetable at all. It is bitter and peppery. If you cook them they get mushy…, and kids ain’t like mushy stuff. However my tongue has constantly been evolved. I love these peppery radishes now. I finally became a grown-up, hallelujah! The Korean radishes, if you can find them, are at their peak in the fall. 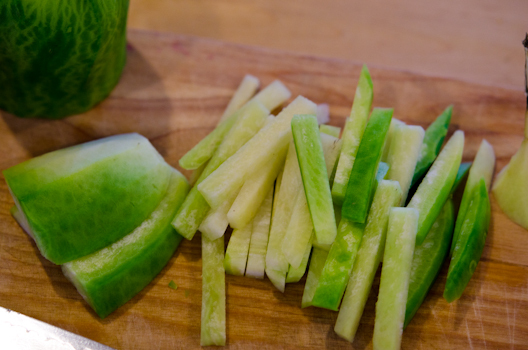 They are sweet to eat as raw and turn into mellow flavor when cooked. I craved the radish rice that I hated as child. I searched for my Korean radishes in Kuala Lumpur, but alas…! No where to be found. 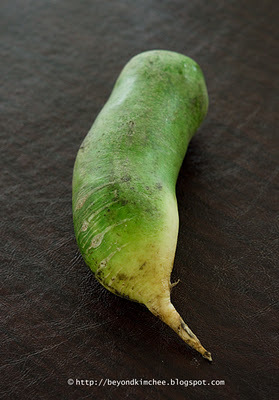 Instead I chose green radish – simply out of curiosity. Have you seen green radishes? This guy is totally green inside out. He is more peppery. So my verdict is; go with Korean one! Here is my fabulous Mr. Korea that I used for my beef radish soup last year. 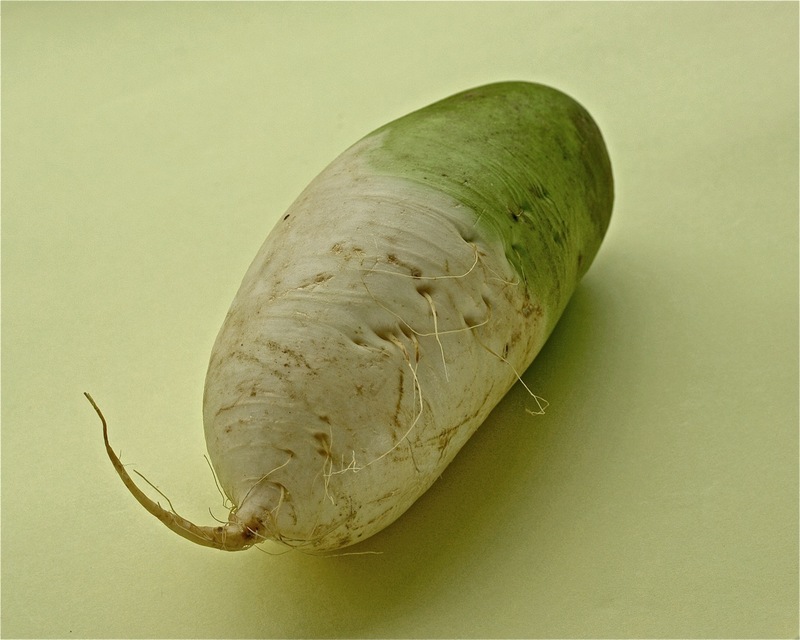 If you are unlucky to find him, then, use Daikon radish instead. In reality any radish will work. I mean they all get cooked into mushy stage but Korean radish will bring sweet mellow flavor rather than peppery kick into the dish. 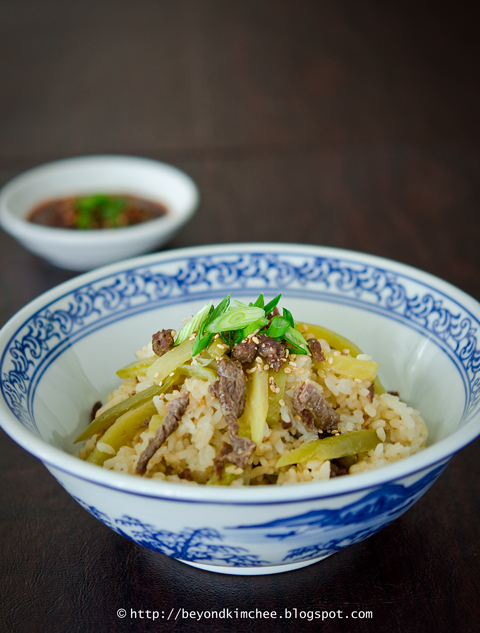 You will like the simplicity of this Radish Beef Rice Bowl. How can you go wrong with simple food? 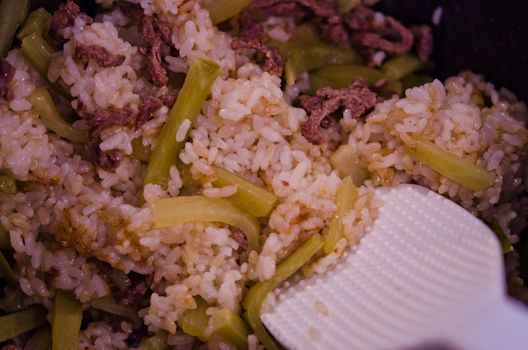 Soy sauce, sesame oil, sesame seeds, Korean chili flakes, rice wine, green onion, garlic, radish, a little piece of beef, and a little bit of sugar that I missed in the photo. 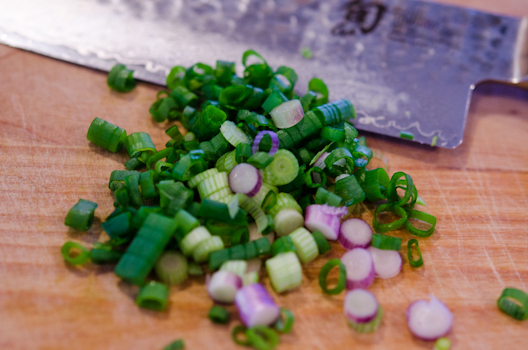 First, time to shine your cutting skills. 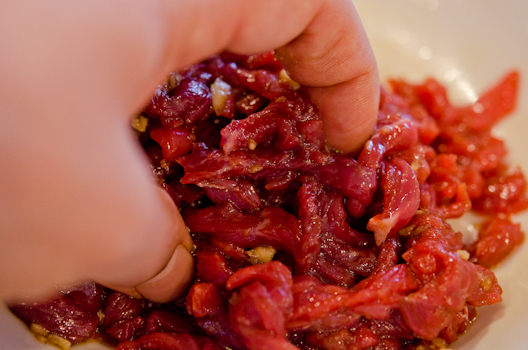 Cut beef into thin matchsticks (cross grain). and toss them together with your hand. Set aside. Here is Mr. Green without his jacket. He reminds me of Mr. Oz in some place over the rainbow. Slice him into 1/4″ thick matchsticks. Get your rice ready to cook. I mixed white and brown rice together. You will need less water than usual since radishes will yield lots of moisture. and the beef on top of radishes. Just scatter them around. 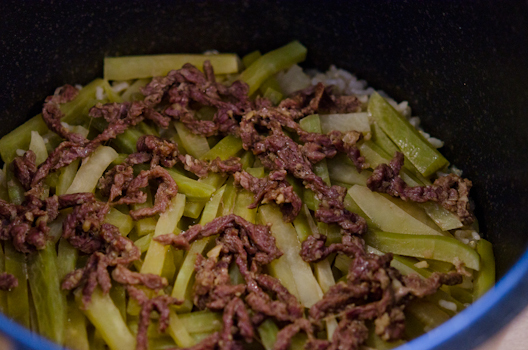 Cook them together in the rice cooker. See! how simple is that? Now go sit down and watch your favorite food network shows for 20 minutes. mix with other dressing ingredients. 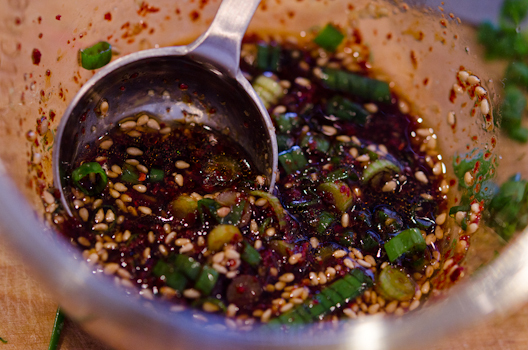 You will like to use lots of sesame oil. Go unveil your rice cooker and you will see this. Then you will want to toss them. 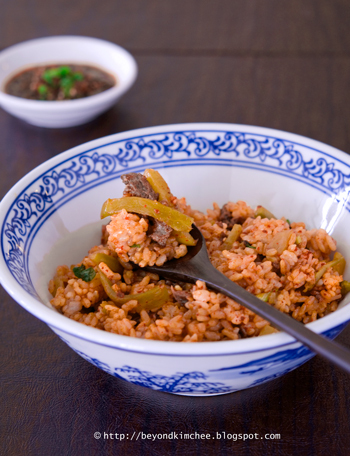 you will find the nice rice “fond (like the kind in Paella)” on the bottom – a flavorful rice crust. 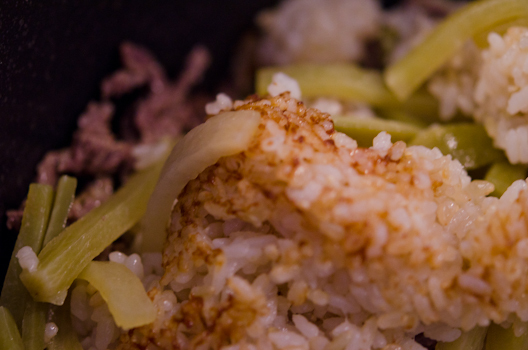 I can see my white rice, brwon rice, radishes, and beef…, all mingled and harmonized. you will want to mix them with the dressing when you serve. What a great mixing job! The green radish was slightly bitter but enjoyable. 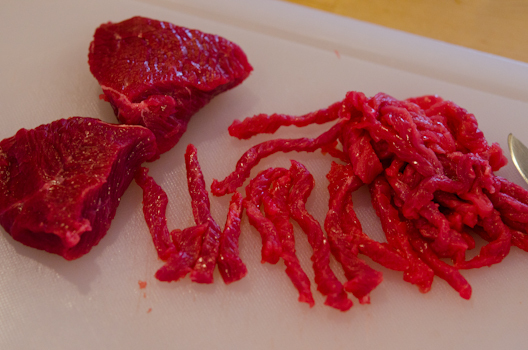 The beef is tender, of course. 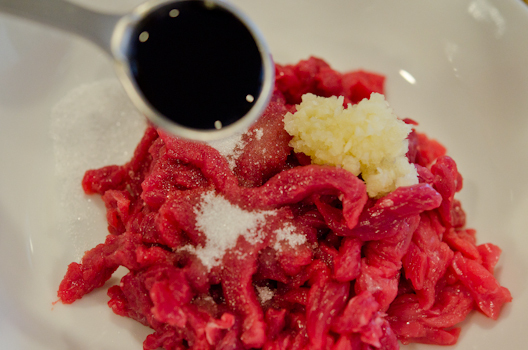 In a small mixing bowl, combine beef with soy sauce, sugar, garlic, sesame oil, and rice wine. Toss them well and set aside. Peel the radish and slice into 1/4" thick matchsticks. Wash and rinse rice, drain. 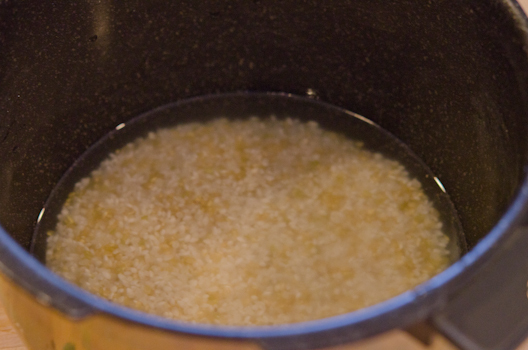 Place rice in the rice cooker with 2 cups water. 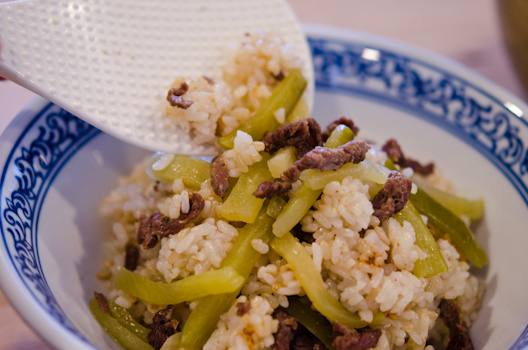 Place radishes and marinated beef on top of rice. Cook rice in the normal setting of your rice cooker. Meanwhile combine dressing ingredients. When rice is ready, toss them gently to mix. Scoop into a serving bowl and drizzle 1 Tbsp of dressing on top and mix them well. Serve warm. This dish looks tasty. 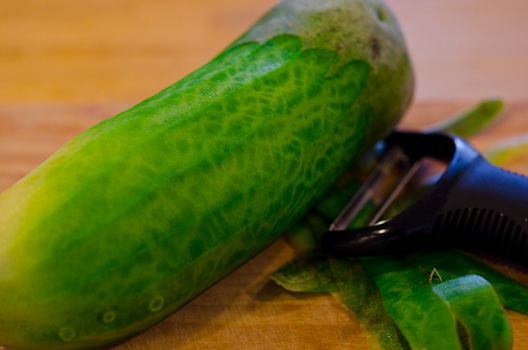 The green radish? I used to made soup with it. Looks good! Can I make it in a pot and not a rice cooker (since I don't have one)? This looks so yummy...! I am still struggling to find that type of radish here in Germany. I only know the long white one. Of course you can make in the pot. Cast iron or heavy type of pot works the best but any pot will do the job. It is called 누룽지 (nuroongji). If you cook rice in a stone pot it forms easily. I love the texture and the flavor. Thanks Katherine. Hope you can give it a try. Do you live in Malaysia? Thanks Angelica. How's your Korean study coming along? That's the daikon radish, the Japanese style radish. You can certainly use that. How long would I cook it in the pot? Well, it depends on the type of pot and the heat. I say boil them first and reduce heat to low and wait until the boil to settle down. Cover with lid and let it simmer for about 15-20 minutes. Turn off the heat and let it sit for 5-10 minutes before you open the lid. Toss and serve with dressing. What a great recipe! Excellent use of radishes. I rarely cook radishes - I don't know why, because I like them. Maybe it's the latent kid in me resisting? Anyway, great job detailing recipe preparation, execution. Thanks. I tried making this last night, and the combination of flavors was delicious! I love the texture of the cooked radish, yumm... unfortunately I had to use a stovetop method since I don't have a rice cooker, and the cooking process didn't work very well (I ended up having to take out the beef and radishes and finish cooking them in the microwave because they didn't cook all the way through over the rice). If I were to go out and buy a rice cooker, what kind would you recommend? I sometimes cook this dish in one of those dutch oven pot (Le crueset) and it worked fine. You have to cover with a heavy lid to prevent for the steam to escape, and needs a little longer simmering time so that it cooks thoroughly from top to bottom. However you can't beat the convenience of rice cooker. I can only give a feedback on Korean brand because that is only thing I have used so far. I highly recommend to get an "electric pressure rice cooker". It cost more than regular kind but worth for me because I have been using mine for nearly 10 years and never had any problem. I have been using it at least 3 times a week. 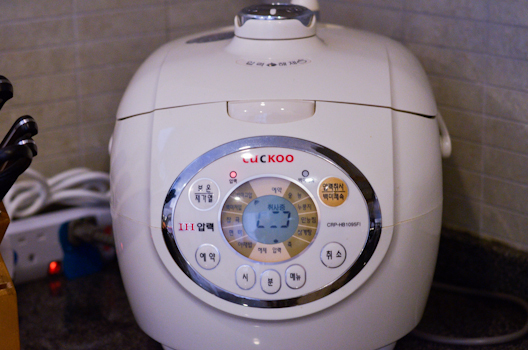 Most Koreans use these pressure rice cooker these days. And they are built tough like a tank. The flavor and the texture of rice is unbeatable. It takes less water and cooks faster. You can use it for making other dishes as well. 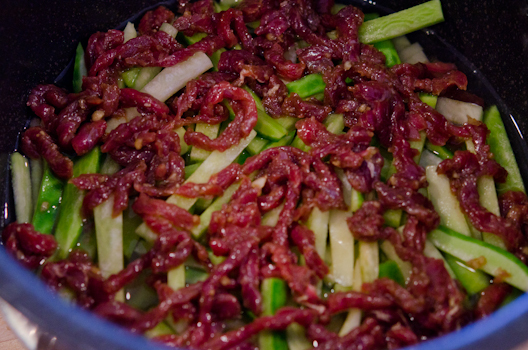 I often make Galbi Jjim in there and works beautifully. The brand I am using is called "Cuckoo"-very famous pressure rice cooker company in Korea. You can find their rice cookers in major Korea grocery stores in the U.S these days with English manual. Amazon sells Japanese brand but I don't know its quality. As far as I know, Koreans are the one started electric rice cooker in their rice cooking. Another good and cheaper alternative is getting a stove top pressure cooker. You can get it through amazon. It is a lot cheaper and yields the same results as electric one. But you have to control the heat and the time yourself. I think it will require a little practice and feel for how much water you have to use to cook your rice with this. Thank you so much for your helpful tips and recommendations! I am so glad to get your personal recommendations on rice cookers ^_^ Guess it is time for me to invest in one! I tried this recipe - it turned out great but I have a question about the dressing - when I made mine, I followed your recipe to the T but my dressing turned out to be a little too salty than I like. Is there a tip for making it less salty? Thanks for sharing! I usually use low sodium soy sauce. 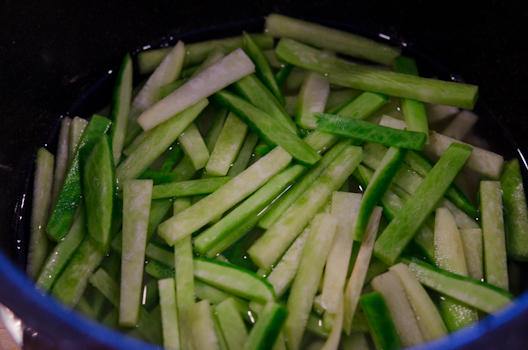 If your sauce is too salty, add more water to dilute it.